This is the “place to be seen” at the beach. Rehoboth hottest bodies of the summer serving you some of the best American seafood cuisine with a twist. Join us for our daily drink and dinner specials, video bar, and our themed costume Tea Dances, DJ remix and Drag Brunch. Come find out why the Washington Post, has included the Aqua Grill sun deck and sand box in its annual Beach Guide for outdoors night life fun. 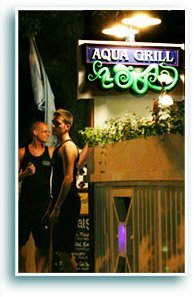 Featured in 2008 Planet Out, Aqua Grill is a gay-owned and operated establishment, but welcomes everyone and features an eclectic mix of avid party-goers, locals, adoring fans and weekly tourists from D.C., Virginia, New York, Philadelphia and as far away as California and Canada. Want to see more about Aqua Grill and Rehoboth you can find us featured on Logo TV on BUMP Travel, Episode 9 season 4. Local Rehoboth Foodie has given Aqua Grill 4.5 out of 5 Stars for overall Food, Service and Value. We are available for parties, celebrations, and catering. Open Seasonally from Spring through Fall. Copyright © 2019 Aqua Grill. All Rights Reserved.